When a wild, untamed woman named Maggie (Fonda) gets on the wrong side of the law due to her criminal activities and is going to be executed, a mysterious man known only as “Bob” (Byrne) steps in and stays the execution. He takes her to a secret training camp to be schooled in the ways of assassination. She learns everything from marksmanship to how to use a computer mouse. After being sent on various missions after graduating from the school, she meets J.P. (Mulroney), her building’s manager, and the two strike up a romantic relationship. However, her secret life as a killer still beckons, and she has to choose what type of life she wants to lead. Does Maggie have the ability to pick another path in life, or has she reached the POINT OF NO RETURN? Point of No Return, as we all know, is a remake of Luc Besson’s La Femme Nikita (1990), which had only come out three years earlier. PONR is slick, Hollywood action all the way, and the 109-minute running time does signal that this is a mainstream release that went to movie theaters. The sort of Hollywoodized action on show here is what director John Badham has come to be known for, and this is a good example of that style, if that’s what you’re looking for. Besides the technical aspects, which are of a high standard, probably the best thing about PONR is the cast. 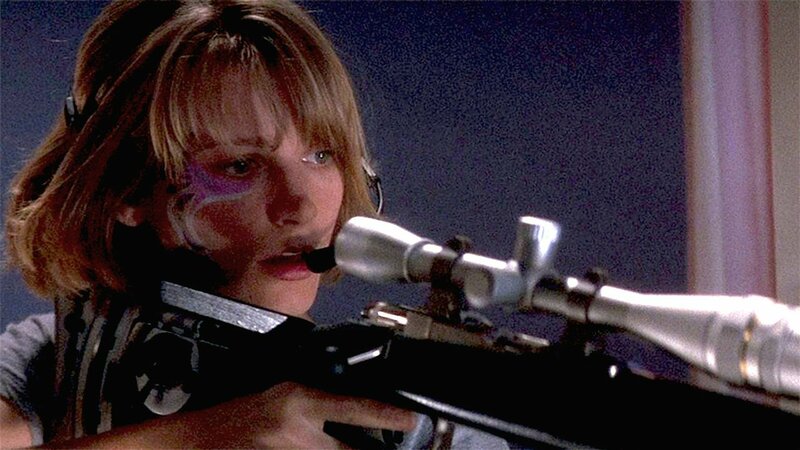 Bridget Fonda shows she can be an action lead, and has versatility in a role that demands her to do a variety of different things. She’s basically the Eliza Doolittle in a situation where Pygmalion/My Fair Lady meets shooting and blow-ups. During her “assassin training” her room is decorated with Pantera and Red Hot Chili Peppers posters and she watches at least one Headbangers Ball-style music video. When she goes food shopping it’s reminiscent of the classic game show Supermarket Sweep, and she gets to show off a bit of humor as well. Gabriel Byrne as her handler and Dermot Mulroney as the love interest are there to support her, though it’s easy to confuse the latter with Dylan McDermott. Or perhaps Costas or Louis Mandylor. Miguel Ferrer and Anne Bancroft provide further support, though it would’ve been nice to see Bancroft shooting people. Sadly, she doesn’t do any action scenes. She just teaches Maggie to act “like a lady”. What a missed opportunity. Harvey Keitel doesn’t show up until 88 minutes into the movie – a point when a lot of other movies would’ve been over already – and is gone by 98 minutes in. That’s right, just ten minutes, and he’s not even in every scene in those minutes. It’s nice to see people skating around Venice Beach on day-glo rollerblades, and using classic Apple computers. However, the film takes its sweet time and there are long gaps in between action scenes. By the time we get to the love story between J.P. and Maggie we were starting to see why the movie was 109 minutes. To keep up the energy, there should have been at least a few more brief action scenes. Maybe Anne Bancroft could have been involved in them. Also, the great song of the same name by Nu Shooz should have been in the movie somewhere, perhaps during a training montage. Another missed opportunity. In the end, Point of No Return is mainstream action fare – it certainly could have used some more streamlining, and some additional edge would have been nice, but it’s ideal for a rainy Sunday afternoon.